The rumors are true. We’ve acquired Mark Hendrickson, one of the top lefties in the AL this year and catcher Toby Hall, plus cash, for Dioner Navarro, Jae Seo and a player to be named later. I’ve pasted the press release below. We’re also putting Brett Tomko on the 15-day DL, so we’ll carry three catchers at this time. LOS ANGELES – The Los Angeles Dodgers announced today that they have acquired left-handed pitcher Mark Hendrickson and catcher Toby Hall from the Tampa Bay Devil Rays, along with cash considerations for right-handed pitcher Jae Seo, minor league catcher Dioner Navarro and a player to be named later, according to Dodger General Manager Ned Colletti. Hendrickson, who turned 32 on Friday, has been among the top left-handers in the American League this season, posting a 2.20 ERA on the road, the lowest mark in the league. He has also held AL batters to a .241 batting average which ranks eighth in the league. Overall, he has posted a 4-8 record and 3.81 ERA in 13 starts, going six or more innings in 11 of those outings while receiving just 3.1 runs per start by his offense (40 runs/13 starts). Among AL lefties, Hendrickson ranks eighth in ERA behind Johan Santana (2.75), Scott Kazmir (3.21), Mark Buehrle (3.27), Barry Zito (3.36), Nate Robertson (3.38), Kenny Rogers (3.44) and Jamie Moyer (3.51). Hendrickson began his professional baseball career in 2000 following a four-year career in the National Basketball Association. The six-foot, nine-inch southpaw was a second-round pick of the Philadelphia 76ers in 1996 and spent four season with Philadelphia (1996-7), Sacramento (1997-8), New Jersey (1998-99) and Cleveland (1999-2000), averaging 3.3 points and 2.8 rebounds in his 114-game career and became the 10th player in Major League history to also appear in the NBA. He will become the tallest player in Dodger history and joins teammate Derek Lowe as two of the 12 players in franchise history to top six-feet, six-inches in height. The Washington native played baseball and basketball at Washington State University and was drafted six times in baseball from 1992-97. He made his big league debut in 2002 and has won 37 games in the Majors, including team-high totals of 11 victories in 2005 and 10 wins in 2004. This season, most of his success has come on natural grass, where he has a 2.09 ERA in six starts, compared to a 5.40 mark on artificial turf. Hall, 30, is hitting .231 with eight homers and 23 RBI in 64 games this season. In seven Major League campaigns with the Devil Rays, he has a lifetime average of .262 with 44 homers and 251 RBI, including career-highs of .287 in 2005, 12 homers in 2003 and 60 RBI in 2004. He has thrown out 35 percent of runners attempting to steal off him in his career (145-for-412). 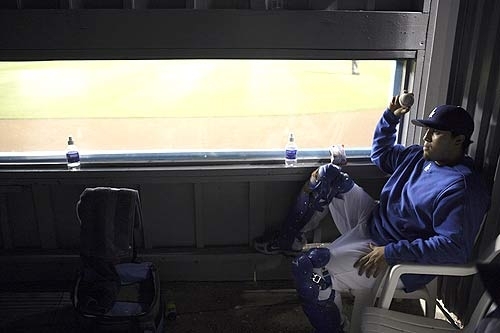 Navarro, 22, batted .280 with two homers and eight RBI for the Dodgers before suffering a contusion to his right wrist and being placed on the 15-day disabled list on May 5. The Tampa resident was optioned to Triple-A Las Vegas on June 15 after being reinstated from the DL. Seo, 29, appeared in 19 games for the Dodgers, including 10 starts, posting a 2-4 record and 5.78 ERA. In 90 career big league games (76 starts), the right-hander has a 24-26 record and 4.13 ERA. Great trade for Hendrickson, way to go Ned !! But why another catcher unless someone is going to the minors or in another trade ?? Or are we going to cut Alomar loose ?? And who’s the starting catcher now Martin or Hall ?? I’m sure Ned has his reasons so I’ll sit back and wait. Keep it going Ned !! great! .. all we need to do now is get rid of mr. soul glow…but does this trade send chad billingsley back to the minors?… i hope not..
i dont think billingsley is going down, they have at least one rotation spot open, and with tomkos injury/lack of production another spot open atleast for a couple turns. release perez. Sounds like a good trade. So far we’ve not given up anything that we’ll miss. I wish Navarro all the best in the other league. Never really got to appreciate Seo, since he didn’t do anything but struggle with us. Maybe he can be resurected in the American League. Hope the player to be named later list does not include any of our present rookies or Guzman. I hope this will give our starting pitching a boost. I LOVE how Ned makes these trades and moves without giving up too much. I mean will anyone really miss navarro and seo? Not me. Kudos to Ned!!! not a #1 starter, but certainly serviceable. really wish we were getting a top top guy, but he’s certainly better than our current 3,4,5,6 guys. really too bad seo hasn’t panned out for us, esp since we gave away sanchez for him — and boy could we use him right now — but at least we’ve got our backup catcher of the future (sandy likely out next year)… and another of our big concerns has been addressed (backup catcher if we trade navarro and if martin goes down). is there any market out there for jose cruz? Do you guys think that Navarro and Seo will help the Rays? I haven’t seen any of either of them. Hopefully you will – I see why the Rays are making this sort of deal – younger for older, cheaper, that sort of thing – But Mark Hendrickson has looked excellent this year, and Toby Hall is Mr Reliable. He’s slumping a bit right now, but is great behind the plate. Hopefully it’s worth our while! * Hendrickson’s Opponent’s BA has droped of hugely this year to .241. * He’s not a strikeout guy, but he’s gotten his pitch counts lower this year. Surprisingly, he’s given up more walks this year (as well as had more strikeouts), but has still been effective. * His home run rate is 1 every 8 innings for his career, and is about there at 1 every 9 this season. * He has made it to the 6th inning in every outing this season. * He has thrown as many as 123 pitches in a game, going 9 innings for a game that ended in extra innings since Tampa Bay only scored 1 run for him in the first 9. * He is 0-3 against Toronto because Roy Halladay has been his opponent each time. * Worst start this year was May 2 against the Texas Rangers, where he gave up 3 homers and 6 runs over 5.1 innings. Game score: 32. * Best start this year was April 6 against Baltimore, a complete game shutout. Game score: 85. Sweet, we got one of the top lefties in the AL. Then why is he 4-8, although he does have a very good ERA. I hope Ned has another move coming, this isn’t enough. However, it should be helpful to have a reliable lefty, gives the opponent a different look. If only we would show up against the good teams…..
Dreed – his run support 3.1 is lower than his ERA – 3.85. Hard to be 8-4 with that. He is a good acquistion for little cost. I really hope Navarro does well but in reality the Dodgers couldn’t keep two young catchers. One has to sit which doesn’t improve his trade value. Martin has earned the spot. Hopefully Seo will also do well. Hall is a good back up. Not sure what Alomar’s status is. Expect he is hurting too much to catch. Good job GM Colletti. Not looking to beat the world in one shot. Looking to improve the Dodger rotation without giving up the future. Also not sure who will be named later. Perhaps, Delwyn Young a nice young player who seems to be the odd man out in the OF. Perhaps Aybar.Perhaps someone lower in the system. I bet we will all be surprised when it is announced. A National League source said the Dodgers approached the Marlins within the past week with a package of highly-regarded prospects and big-league ready players. According to the source, Florida said Willis wasn’t available. Gary: Im pretty sure Martin has the starting catching job locked up! Looks like we overpaid once again. Seo and Hendrickson are a PUSH, in my opinion, its just Hendrickson has performed better recently. Kinda like how Ned went after Seo because he had a stong second half last year. That worked out for ya well didn’t it Ned! Hendrickson’s career ERA is over 5! Sure he should fare better in the NL West vs. the AL East but this guys no more than a #4 or 5 starter. We definitely haven’t gotten the best of any recent deals -Carter and Baez for Tiffany and Jackson…Seo for Duaner Sanchez…VASTLY overpaying for Furcal when we had an (injured) gold glove SS- but Ramon Martinez/Oscar Robles would have given us as much, and probably more than Raffy and his 16 errors. Ned’s ONLY good move has been signing Nomar. He was handed an A+++ Farm system (thank you Logan White) that is saving his behind right now! There should be no way the player to be named is a top prospect/major leaguer. Better be a single A guy, or you truely got hosed Mr. Coletti! I think we were better off yesterday. Hendrickson has put up some good numbers this year, and hopefully that continues…but at this price (top prospect + major league starting pitcher) for him and a backup catcher…Too much. Only bright side I see here is at least Hall can throw out baserunners (@ a 35% clip). Thats more than we could say about Mr. Navarro. have seen hendrickson a few times on the dish the last two years. plus i know him as sixer here in philly. he looks like “big unit” but throws as hard as odalis. might top off at 90 mph, no lie! i know his stats are eye-raising, esp in tampa bay, but i agree, its really a wash with seo. hendrickson at best is a #4 and who knows how he pitches in a real race, with a full house and major media market. still glad to see navarro leave. still can’t figure why depo was so high on him. Probably should add Liriano to that list of AL lefty pitchers. He might be better than all of them.